All is fair in love and law. . . . .
​Regina Valentine is at the top of her game as a defense attorney for a prestigious Houston law firm. Benjamin Fontaine is the latest hot shot associate at the District Attorney's office. "I couldn't put this book down. I love romantic love stories that end happily ever after. This was so perfect!!!" "A page - turner! This book really captivated me. I was interested in reading on to see how it ended. Very good read!" "This was my first read for this author. A nice legal story with a touch of romance was just the ticket.. This story was emotional and told with a nice voice. In this story, The Golden Girl, Regina Valentine was known for her successful track record of winning the majority of the criminal cases she undertook. The attorney she longed to always best was the handsome and debonair Benjamin Fontaine. She had already won the high profile case against him. Now they were set to meet again when the old case was set for a retrial. New evidence brought the adversaries at war again. What they had not counted on was the strong attraction. Their attraction and professional ethics aside, a relationship could've easily derail both their careers, if they acted upon the attraction. The story focused on the relationship, family issues with Regina's family, and the difference between the Fontaine family and the Valentine's. A very nice story. The story did not have an abundance of intimate moments however, what was presented was tastefully done. I liked Brandon and the other Fontaine family. Regina's ex Tony was suspect at times in his behavior. Overall the story was a very good read." "I loved this book! Read this book on a rainy afternoon and couldn't stop. I laughed and cried throughout the story. Loved Ben and Regina, loved everyone!" 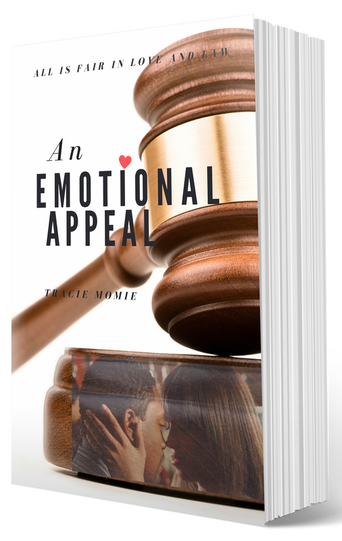 "This was my first book by Tracie and I really enjoyed it! Baby I'm here for two black professionals & a solid black family!" "Regina & Ben are relatable characters. Loved story from beginning to end. Really good read. Definitely would recommend to those who love to laugh and cry. Tracie Momie has done it again."